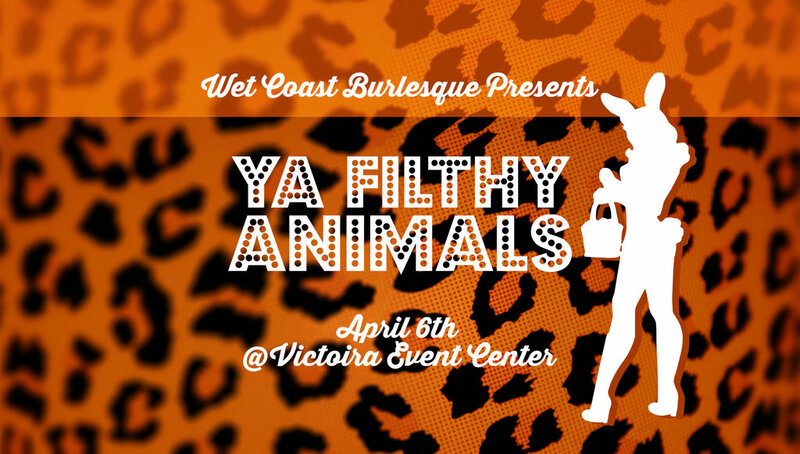 Event Archive - Wet Coast Burlesque Presents: Ya Filthy Animals: CHASTITY TWIST, Minnie Perone, Cherry Cheeks, Glitter Purr, Misty Moss, Cinnamon Kicks, Tongue N'Cheek, & more! $22 Advance, $25 Door, $30 VIP at the door only. Spring is in the air. The pheromones are running wild in the great outdoors and the animals are feeling the heat. But are you? Come on down to the Victoria Event Center April 6th and we will get you in the mood like the rest of those beasts, ya filthy animals.